Kidney Pain North Fort Myers – Call (239) 458-1196 today! Kidney pain — also called renal pain — refers to pain arising from infection, injury or inflammation of a kidney. You may feel kidney pain as a dull, one-sided ache in your upper back, often accompanied by fever and urinary symptoms. Some people are surprised to learn exactly where the kidneys are located. Your kidneys are located relatively high in your body, under your lower ribs. It’s not unusual to attribute back pain or side (flank) pain to your kidneys. Dr. Caesar has published many book chapters on subjects ranging from robotic kidney surgery to prostatitis. He has researched and written articles on a variety of topics including kidney cancer, laser treatment of BPH (enlarged prostate), and hematuria. While at Penn, he worked with and trained under a number of leading surgeons and experts in the field of urology. He maintains a very strong relationship with the institution and its affiliated hospitals. Don’t Wait! Get Answers and Schedule Your Kidney Pain North Fort Myers Appointment Now by calling (239) 458-1196 today! 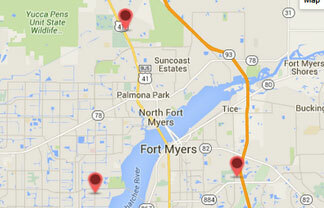 Schedule a Kidney Pain North Fort Myers Appointment Today!